A: Pocket gophers construct burrows under the ground using their strong forelegs, enlarged claws and even their teeth. Their vision is poor because of their habitat. Their hearing is poor, too. When the gopher digs, it kicks the dirt behind it with its hind feet. When a lot of loose dirt has accumulated, it turns around and pushes the dirt to the surface using its forepaws and face. The resulting mounds are an indication of their presence in your yard. Actually they are very beneficial animals. A single gopher can move about a ton of soil to the surface every year. Their tunnels are constructed and then fill up with dirt as they are abandoned. The old tunnels contain the nests, waste material and partially filled pantries well below the surface where they become important as fertilizer. 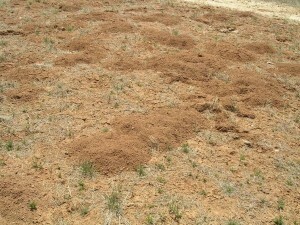 Soil that has been compacted by cattle trampling, grazing and machinery is benefited by the tunneling process of gophers. In the mountains, snow and rainfall are temporarily held in gopher burrows instead of running across the surface, causing soil erosion. 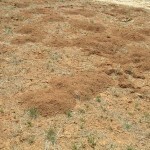 The mounds the gophers make also bury vegetation deeper, thus increasing soil quality over time. Additionally, fresh soil in the mounds provides a fresh seeding area for new plants, which may increase the variety of plants on a site. Gophers are also in the food chain and are fed upon by large birds, other mammals and snakes. Other animals such as lizards and toads take refuge in the cool, moist burrows. As much as I am trying to make the case that gophers have a place in our area, there are times when we have to control them. Poisons are available, but I never recommend them. Most of the gopher baits contain strychnine, diphacinone, chlorophacinone or zinc phosphide. None of these rodenticides are very pleasant and accidents can result with other animals digging them up. There are traps available that can be placed in the burrows, but they are not easy to use and have only limited success. I have found that the best method of gopher control is simply asking them to move. You can do this by pouring a foul smelling liquid into their tunnel system. Fish oil emulsion works and I have been told that castor oil is also effective. Since gophers generally live alone, once they move, they are not likely to return unless they are forced to move again, so a repellent can be very effective. When using a repellent, you will have to probe the dirt to find their tunnels. Generally a tunnel will run straight between two mounds and they are normally about 18 inches below the surface. You can use a metal rod or even a pool cue to probe the dirt. Once you hit the tunnel, the probe will fall through. Then take a long-stem funnel such as used to put oil in cars and place it in the hole created by the probe. Pour the repellent into the funnel and move on to the next tunnel. A: Absolutely. Researchers calculated that one kilogram of sulfuryl fluoride emitted into the atmosphere has a global warming potential approximately 4,800 times greater than one kilogram of carbon dioxide. That is pretty impressive. Go to http://scrippsnews.ucsd.edu/Releases/?releaseID=965 for information. The chemical’s annual use in California creates emissions equivalent to the carbon dioxide produced by 1 million cars and California accounts for 60 percent of the sulfuryl fluoride used in the world. We don’t use anywhere near that amount in New Mexico, but it is registered for use here and has been used occasionally when drywood termites are found in a home. I believe with a record like this, sulfuryl fluoride won’t be around much longer. Contact him: Richard “Bugman” Fagerlund, an entomologist, owns and operates “Ask the Bugman” Common Sense Pest Management. He can be reached by phone at 385-2820 or by e-mail at richardfagerlund@yahoo.com. His Web site is www.askthebugman.com. We’ve gotten a lot of calls about “prairie dogs” that are actually gophers. Know your signs! Their mounds look like this. The fresh dirt is a dead give away. Notice that there is no discernable opening. When the burrows collapse you might see a 1-2″ hole. These are not prairie dogs. If you want to read more about pocket gophers, and how to handle them when they are in your yard, please read our Pocket Gopher Protocol. 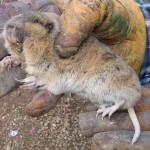 I found a recent article about pocket gophers which contains some excellent pictures, one showing the “pockets.” To read the article click here. Prairie Dog Pals receives frequent calls about mysterious animals burrowing in people’s yards. Typically, residents are alerted to the presence of these animals by fresh mounds of dirt. There are no apparent burrows and the responsible animal is infrequently seen. While prairie dogs can be dispersed by construction, disturbance, or by territorial issues, in most cases the burrowing animal is a pocket gopher. To help homeowners cope with these uninvited guests we have prepared this overview of pocket gophers, their habits and some suggested interventions. Pocket gophers of New Mexico and much of the west are not to be confused with animals of trans-planted New Mexicans former homes, like gopher tortoises of southeastern U.S., gopher snakes of the Midwest and West, or “gophers,” another common name for some species of ground squirrels (with stripes or spots on back). True pocket gophers are actually rodents distantly related to pocket mice and kangaroo rats but are even more adapted for digging. They do share with the night-active pocket mice and kangaroo rats the fur-lined cheek pouches for temporary transport of their food. 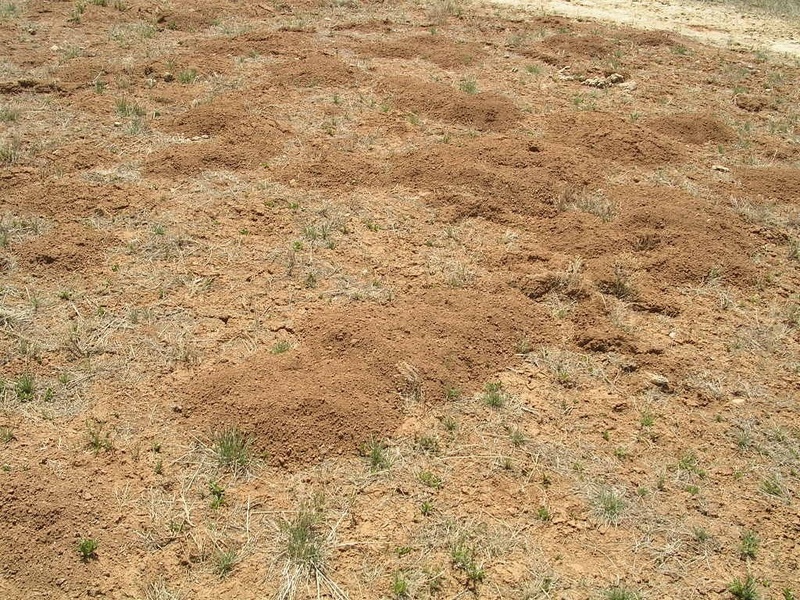 Unlike moles that occur in areas such as the eastern U.S. and the Pacific northwest that are wetter, most pocket gophers occur in drier soils of grasslands and deserts. Moles are insectivores and have peg-like teeth for breaking up insects, earthworms, and other invertebrates, while pocket gophers eat plant material. There are seven different species of pocket gophers in New Mexico and more than 35 are found in the Americas from Canada to Costa Rica. Only one species occurs east of the Mississippi River. They vary from 5½ to 7 ½ inches inches long and weigh from 6 to 8 ounces. They have two pairs of incisor teeth to cut roots and shoots and complex molars to grind the plants up. They have paddle shaped front feet for digging through the soil and a small sensitive tail that allows them to back up in their dark burrows. What do pocket gophers do? Pocket gophers dig and often leave mounds of soil heaped over the plug of their exit/entrance hole. Prairie dogs do not make mounds but do dig holes that enter to their underground burrow. Sometimes there are volcano-like craters around a prairie dog hole. If you can see an open hole in the ground then it is not a pocket gopher. Pocket gophers hide their hole by plugging them when not in use. 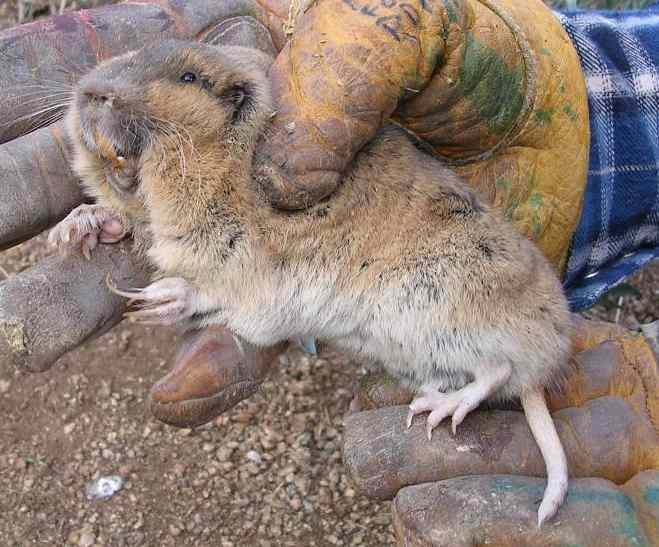 Pocket gophers spend about 99% of the time below ground level in search of fleshy plant roots, bulbs, and shoots. Should I worry about pocket gophers digging? If they were in your lawn, I would say no. The plants they target are broad-leaved plants and your grasses are narrow leaved plants with unappealing narrow roots. The fussy lawn keeper regards the broad-leaved plants as weeds. So the pocket gophers are helping the average gardener and lawn keeper weed their property! Cool, huh? And they do it for free! These little guys (and gals too) spend their time wandering through their maze of underground tunnels and digging new ones. Their digging action brings deep soil rich in minerals to the surface, thereby mixing it. Their droppings fertilize the soil adding nitrogen and organic matter. Their tunnels allow for the mixing of oxygen and carbon dioxide to allow your plant roots to breathe. They are doing this 24 hours a day, 7 days a week, and 365 days a year…for free! They are in fact master gardeners! What if I don’t like those stupid mounds? Take the backside of a rake and stroke it across the gopher mound until smooth. Repeat when you see other mounds. They only make the mounds when they are digging new tunnels. Although they don’t hibernate, their moundbuilding peaks in the spring when the soil gets warmer and after rains during and after the monsoon season of late summer. What if they are in my flowerbed or garden? Providing that your gopher-free zone is small and your prize flowers very valuable, you may want to circle your entire area with hardware cloth. The openings in the wire must be smaller than ¼ inch so they can’t penetrate. Early in the spring I would dig up the bed and lay the hardware cloth folding it in the corners and let it extend above ground level by about 6 inches so that the gophers can’t just crawl over the top. This whole process is a lot of labor. What about pouring different liquids into the soil? Liquids are a real mixed bag and can be classed as poisonous and nonpoisonous ones. If they are poisonous to a pocket gopher, then they could be poisonous to our dogs or people. This is true especially around vegetable gardens. Prairie Dog Pals does not recommend their use. Mix 4 tablespoons each of liquid dish soap, urine, and castor oil with ½ cup of warm water. Add this mixture to 2 gallons of warm water and apply. *Please see disclaimer at the bottom. Many kinds of pocket gophers are common, but some are rare and protected. First, check with your state wildlife and city humane departments. If it is legal in your area, the live trap Prairie Dog Pals recommends is the Baker-Williams live pocket gopher trap for residential situations. It takes a fair amount of determination to successfully trap them, but here are the basics. Prior to trapping you must select and prepare a nearby site for release. Find exit/entrance hole by brushing aside dirt of mound with hands. Look for a darker circle. This will be the plugged hole. With iron rebar, carefully probe around for a connecting runway. The rebar probe will sink easily when it hits the air pocket of the runway. Dig down until you can see a runway. Set either one trap (or two traps if the runway goes in both directions) with open end into runway at a gentle slope. Check each hour to keep animal alive and healthy. A carrot can be inserted into end of trap to keep the little guy/gal happy while you prepare for the relocation. Prepare a release tunnel with an auger or long spade by digging down about 2-3 feet. Insert pocket gopher by placing the open end of the trap into the hole. After the animal is in its new home, cover the hole with excess soil. There are other options for golf greens and other similar type lands. What other ideas are there for non-toxic control? Here are a few control ideas that may show promise. Plant plants that gophers don’t like. Install vibration devices. Plant plants only in plastic or tile pots. Encourage and allow gopher predators to frequent the area. For instance, you might want to construct owl boxes or create raptor perches to encourage those animals to stay in your yard. Enclose the yard for free range of your pet dog or cat in the back yard. What if I still can’t stand pocket gophers? I would suggest you get a copy of the classic movie “Caddie Shack” with comic Bill Murray on a fictitious madcap quest to catch a mythical “gopher.” Watch the tube, pop open a cold drink, chill, and have a good laugh. If you still want us to 1) live-trap your pocket gophers or 2) use other nontoxic methods on a trial basis, then contact us. Our going rate is $35 per hour for our live-capture and deterrent application services. Spring is a good time. However, during the summer we are heavily involved with prairie dog relocation. *For the reasons mentioned above Prairie Dog Pals does not recommend liquids or poisons of any kind to solve pocket gopher problems. Keep these liquids out of reach of unwary humans, children, pets and wildlife. by Paul Polechla Jr., Ph.D.